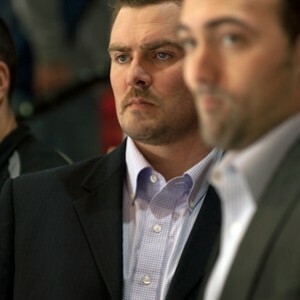 After battling with a nagging knee injury that led to undergoing an osteotomy on his left knee, London, Ontario native Mike Van Ryn decided to retire from the National Hockey League with the Toronto Maple Leafs on June 30, 2010 and transition into coaching the Ontario Hockey League’s Niagara IceDogs. The new job would require Van Ryn, his wife Amber-Lyn, along with children Kaylie and Tucker to relocate from their main ranch just outside Fort Lauderdale, Florida, to Niagara-on-the-Lake, where they now feel right at home. The move came quickly after Van Ryn learned he would not be able to return to NHL playing shape, and after discussions with his agent and a recommendation from the Toronto Maple Leafs organization, he accepted the position with the IceDogs and hasn’t looked back since. “It’s been a lot of fun working with the kids and trying to improve their games and build a championship team here in Niagara,” says Van Ryn. “I’ve learnt a lot working with Marty and I’m hoping to learn a lot more from him. Van Ryn’s playing career began in Ann Arbor, Michigan where he played his first two seasons of junior hockey at the University of Michigan. From there, Van Ryn was drafted by the New Jersey Devils in the first round of the 1998 NHL Entry Draft, before leaving Michigan to finish his junior career with the Ontario Hockey League’s Sarnia String in 1999-00. Although he never ended up reaching terms with New Jersey, Van Ryn signed a three-year deal with the St. Louis Blues in June of 2000. He then played his first NHL game with the Blues in the 2000-01 season, while also spending time in the minors in Massachusetts with the American Hockey League’s Worcester IceCats. Van Ryn would then be traded to the Florida Panthers in 2003 where he played the bulk of his career, and where he also met his wife Amber-Lyn – a Florida-born “southerner”, as he likes to call her. In 2008, Van Ryn was traded to the Toronto Maple Leafs, where he played 28 games in 2008-09 before suffering the disappointing knee injury that would end his playing career in the NHL. 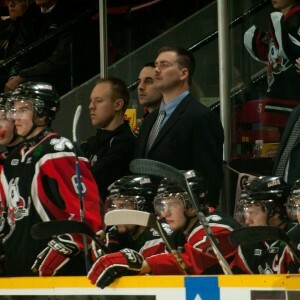 Van Ryn has since helped the Niagara IceDogs to a 27-10-2-3 record placing them 5th overall in the OHL standings. The bulk of his responsibility lies with the defensive squad, and he has helped breed some impressive future prospects – one being six-foot-four blue-liner Dougie Hamilton, who is currently ranked to go 7th overall in the 2011 NHL Entry Draft by the NHL Central Scouting Bureau. At the ripe age of 31, Van Ryn plans on gaining as much experience behind the bench as possible while in the OHL, and maybe one day we will see him back in the NHL – as a coach.